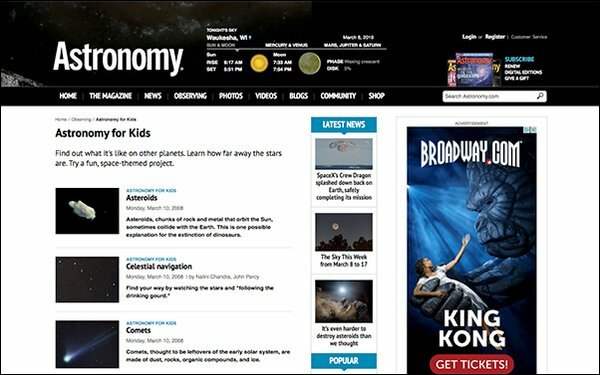 Following its strategy to expand its science offerings and ecommerce division, Kalmbach Media Science Group announced the launch of print and digital special publication Astronomy for Kids. The 100-page magazine retails for $9.99, featuring 30 stories along with additional activities, comic and games to teach kids the basics of stargazing in an engaging and entertaining way. Topics covered include the moon, planets, comets, the Hubble Space Telescope and solar eclipses. There are also 11 hands-on STEM projects included. Advertisers signed on for Astronomy for Kids include telescope makers Celestron and Sky-Watcher, augmented reality star viewer and app Universe2go, along with the makers of the handheld Night Sky planisphere. The media company decided the time was right for a kids-focused astronomy magazine after seeing several related stories perform well in Astronomy. Part of the company’s strategy to expand its science category included paying greater attention to kids and families, as well as throughout the educational and STEM markets. The launch of Astronomy for Kids offers Kalmbach an opportunity to expand related products across its MyScienceShop, where revenue has grown by over 300% since launching in 2015. The company credits the growth, in part, to a 150% increase in site traffic and the release of more than 500 new science-related products. The new magazine will be promoted through direct-to-consumer sales and aggressively across social media, in addition to the ecommerce site. With the launch of Astronomy for Kids, the science shop also features exclusive products developed for STEM audiences. These include globes of the solar system, constellation flash cards and meteorite kits. An earth plush toy that was launched aboard Elon Musk’s Dragon has since sold out.